The little kid in everyone remembers reading comics, but what Reading With Pictures, with the help of Challengers Comics + Conversation, hopes to do is bring that experience into the classroom. “We are trying to push the boundary of what something means to be educational,” Elder says. The organization works on research and puts out materials and guideposts for teachers, showing the educational value of using comics in the classroom. Their newest project is an anthology. The anthology shows what Reading With Pictures is all about, with every story in the book designed to serve an educational purpose. 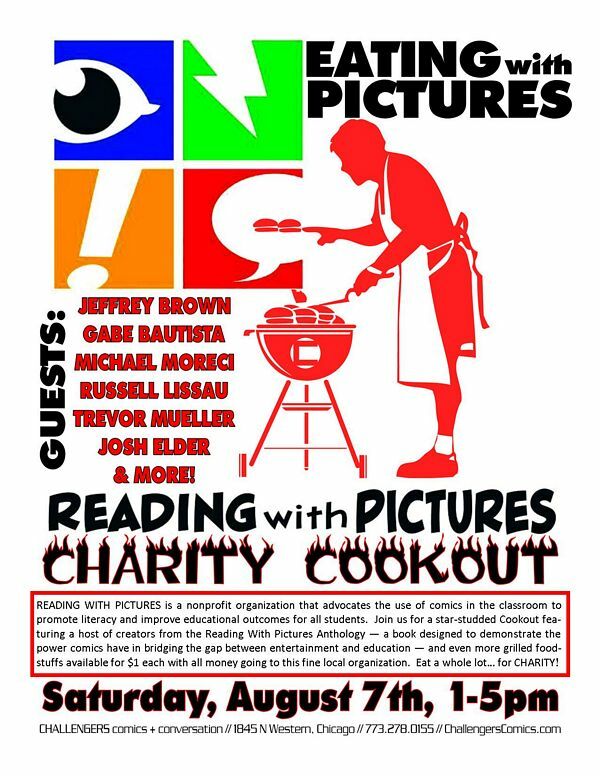 The anthology will be premiered this Saturday at Challengers, at a cookout benefit aptly called Eating With Pictures. Challengers has a history of throwing benefits for many local organizations, and a barbecue they held last year inspired this collaboration. “We love comics and most of us in the comics industry learned to read using comics. When you’re a kid, reading comics and you come across a word you dont understand, you look it up […] How can we not want to do stuff with them?” Patrick Brower of Challengers says. Brower says that the cookout will be “like a casual neighborhood barbecue.” Many of the creators and contributors will be present to answer any questions and to do signings, but they won’t be sitting behind tables, or have anything too structured or forced.